A Thirst for More: Forward-thinking project teams regard water as a precious resource. Explain why water conservation is important even in regions not prone to drought. Describe the goals and the structure of the Living Building Challenge. Identify the elements in a potable rainwater-harvesting system. Discuss some of the regulatory challenges sometimes encountered by projects trying to implement ultra water-conserving strategies. Some have declared California’s water woes over. As of early last month, precipitation in many parts of the state was on track to make this winter one of the wettest on record. Reservoirs were filling up—so much so that one dam in Northern California seemed on the verge of collapse. But others say not so fast. As of press time, much of the middle and southern part of California was still considered in moderate to severe drought. And, in fact, the state’s Water Resources Control Board announced an extension of its existing conservation regulations on February 8, with prohibitions against practices such as watering lawns after rainstorms and hosing down sidewalks and driveways, citing still-depleted groundwater supplies and the lingering effects of the drought on agriculture, fish, and wildlife. 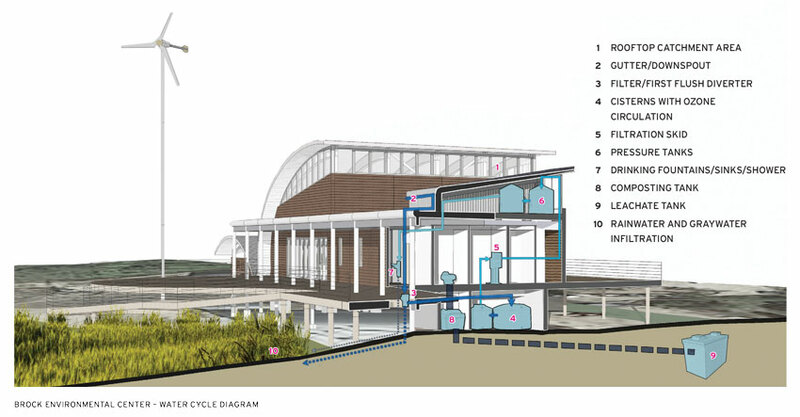 SmithGroupJJR’s Brock Environmental Center in Virginia Beach, Virginia, is the first commercial building in the country permitted to capture and treat rainfall as drinking water. Those who follow water-use issues closely, however, say that conservation is not just for drought-plagued regions or arid places. Rob McDonald, the lead scientist for the Global Cities program at the Nature Conservancy, points to the effects of climate change. Water supplies all over the world will see the effects of warming temperatures, shifting precipitation patterns, and more extreme weather. Other sources make the case that conserving water means saving energy. They point to a relationship known as the “energy-water nexus.” The term is used to describe the interdependence of the water used for energy production and the energy consumed to extract, purify, heat, or cool water, and then clean and dispose of wastewater. “Treating and moving water around has a substantial energy footprint,” says Justin Stenkamp, a senior associate in the Seattle office of engineering firm PAE. The amount of energy expended on water varies greatly by region, but nationwide it accounts for about 4 percent of electricity consumption, according to a 2002 Electric Power Research Institute Report. Using less water also means improved water quality. Amy Vickers, an independent water planning-and-policy consultant based in Amherst, Massachusetts, cites the problem of algae growth in waterways caused by runoff from farms and yards. But what can architects and their consultants do about these problems at the scale of individual buildings? With so much water policy set at the state and regional levels, it is only natural for design teams to assume that there is little they can do beyond selecting efficient plumbing fixtures or specifying native landscaping. However, architects can help drastically reduce water use by looking at their projects holistically. 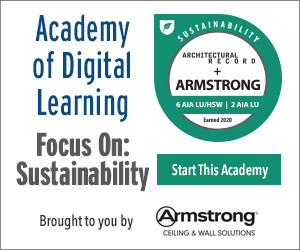 One possible road map is offered by the water-conservation ambitions of the stringent Living Building Challenge certification program (LBC), which requires “net-positive” water performance. This means, according to the International Living Future Institute (ILFI), the nonprofit organization that oversees the LBC, that a project’s water supply must come from captured precipitation or from recycled water and that stormwater and wastewater should be managed on-site through reuse, a closed-loop system, or infiltration. The idea is that a Living Building is one that “has a positive impact and restores the ecosystem around us,” says Amanda Sturgeon, ILFI CEO. Those familiar with the standard will know that water is only one of its many aspects. Achievement of “living” status entails satisfying 20 imperatives organized into seven performance areas: place, energy, health and happiness, materials, equity, and beauty—in addition to water. Full certification has proved tough to attain, with only 12 projects, so far all in the U.S., certified as full Living Buildings since the program’s launch in 2006. The small number of certified projects is not surprising, given that one of the aims of the LBC program is to transform the design and construction industry and challenge established practices. The net-positive water imperative is no exception: many of its recommended strategies conflict with building codes and health department regulations in some jurisdictions. In cases when these conflicts can’t be resolved, ILFI does grant exceptions, as long as a project team can demonstrate that it has been an advocate for change. Lately, however, LBC projects have had some success implementing progressive water strategies. 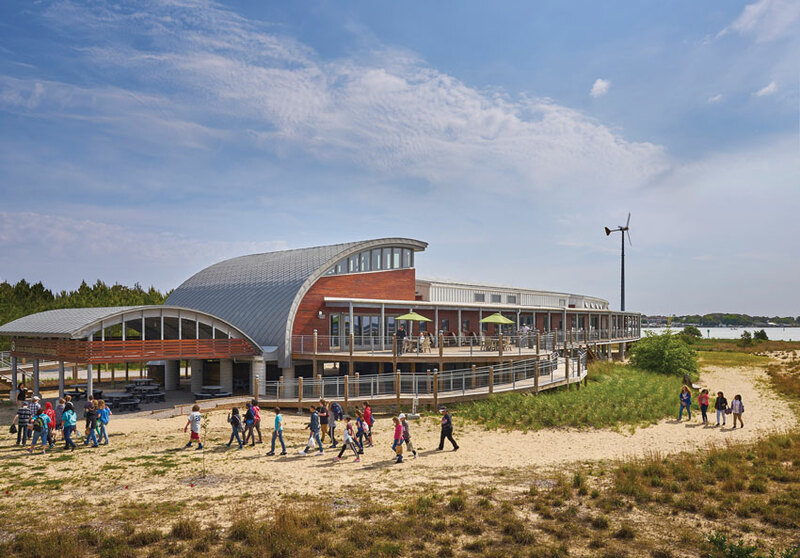 One such project is the Chesapeake Bay Foundation’s Brock Environmental Center in Virginia Beach, Virginia, designed by SmithGroupJJR. The 10,000-square-foot structure hosts the nonprofit’s educational and outreach programs and houses offices for its staff. Completed in late 2014 and LBC-certified in the spring of 2016, Brock is the first commercial building in the continental U.S. permitted to capture and treat rainfall for use as drinking water. The toughest part of realizing this rain-to-potable-water system, according to Greg Mella, SmithGroupJJR’s director of sustainable design, was devising a waterworks that would satisfy the requirements of Virginia’s Depart­ment of Health and its Office of Drinking Water, but was scaled appropriately for the building’s modest size and would be easy to maintain. In the resulting system, rainfall is captured from about half of its 10,000 square feet of arced and sloped standing-seam roofs and stored in two 1,650-gallon cisterns. The water then undergoes numerous filtering and disinfecting steps, including treatment with UV light and ozone, and—at the insistence of local authorities—chlorine, before it is supplied to the low-flow fixtures, including bathroom and kitchen sinks, water fountains, and a shower. (Instead of conventional toilets, Brock has composting ones.) Once used, the relatively clean wastewater from the plumbing fixtures, known as gray­water, along with excess runoff from the roofs, is piped to rain gardens. These landscaped depressions naturally filter the water and allow it to slowly infiltrate into the ground. The Brock project team was not the first to try to permit a potable-rainwater system in a commercial building. Several years before, the Bullitt Center in Seattle (RECORD, June 2013, page 217) covered the same ground. But the Miller Hull–designed 52,000-square-foot, six-story office building, completed nearly four years ago, does not yet have the necessary regulatory approvals to begin using the rainfall collected from the structure’s roof and stored in a 56,000-gallon basement cistern to supply showers, sinks, and drinking fountains. In the meantime, the center has an exemption from ILFI allowing it to rely on the municipal utility for its potable water and still satisfy the certification system’s water requirements (the building received LBC certification in 2015).